What is a Gateway Spam Filter? A gateway spam filter is an on-premises software solution for filtering email. Usually installed as a virtual appliance behind the network firewall, a gateway spam filter eliminates the vast majority of spam emails from the communication flow, ensuring clean emails arrive at their destination. Anti spam gateway solutions can have a positive impact on network security. Tests have shown anti spam gateway solutions can detect 99.9% of spam and reduce network´s exposure to email-borne threats such as phishing, malware and ransomware. Why On-Premises rather than Cloud-Based? The best spam filter for business use will depend on the needs of your business and the level of protection you need. Despite the trend towards cloud deployment, there are businesses for whom on-premises solutions are necessary. The businesses may be subject to federal or state regulations regarding the security, visibility and accessibility of data, or may have concerns about connectivity and latency because of their location. On-premise solutions can also be more customizable than cloud-based solutions. In terms of spam filtering solutions, there is little difference between a gateway spam filter and a cloud-based spam filter. Both solutions are equally as effective at detecting spam (assuming they have the same features and settings) and require little maintenance. Updates are performed by the service provider, who also provides technical support to guide businesses through any issues they encounter. If your business is considering the implementation of a gateway spam filter, it is important to note that not all anti spam gateway solutions are the same. Whereas all anti spam gateway solutions use real-time block lists to block emails sent from known sources of spam, not all use “Greylisting” – a process acknowledged to prevent emails from previously unknown sources entering the network. Similarly, most anti spam gateway solutions have Recipient Verification and Sender Policy Framework tools to enhance email security. Few have SUBRL filtering to detect malicious URLs. This feature in particular can help reduce the network exposure to phishing attempts. With fewer phishing emails delivered, there is less likelihood of a user revealing log in credentials or other sensitive information. Not all business will be aware of the benefits of an outbound secure email gateway – or even what it is. An outbound secure email gateway allocates a Spam Confidence Score to each outbound email and inspects it for malware. If the Spam Confidence Score is too high, or it contains malware, the email is quarantined and a report sent to the network administrator. This process prevents a business´s IP address being blacklisted by global block list agencies for high levels of spam – a scenario that could occur inadvertently, or if a corporate email account has been compromised by a cybercriminal and is being used to send spam from a “trusted source”. The process also flags malware on the network that has not yet been identified by anti virus software. SpamTitan is one of a group of companies that has been developing online security solutions since 1999. Due to our experience in the industry, we understand that for any online security solution to be effective it has to have ease of use. Therefore we have designed our gateway spam filter to have the lowest maintenance overheads and the maximum user-friendliness. Our gateway spam filter is simple to install, configure and manage. User policies can be imported via directory synchronization or applied via a web-based administration portal. Spam Confidence Levels can be applied universally, or by individual user/user group as required; and, from the portal, network administrators can drill down into historic data to conduct risk assessments and identify sources of email-borne threats. 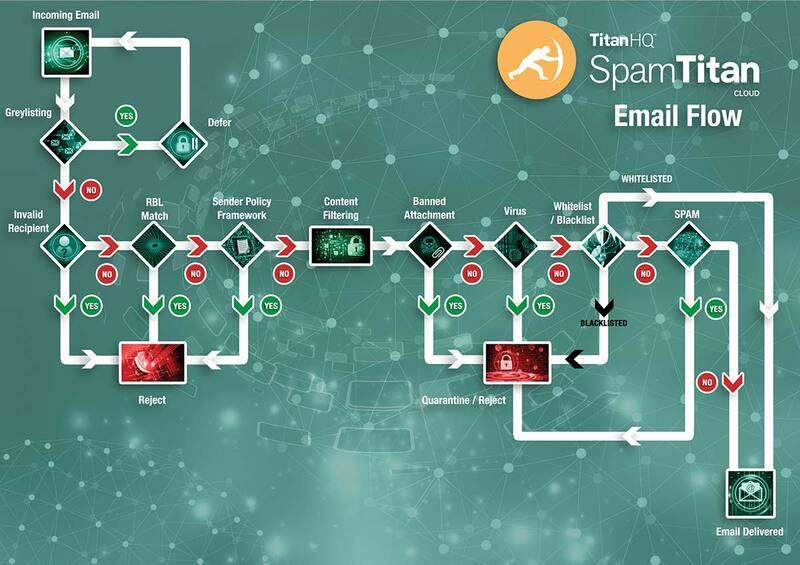 SpamTitan´s gateway spam filter is an ideal solution for businesses wishing to keep their email security “in-house”. Features include greylisting to identify spam from previously unknown sources and SUBRL filtering to detect malicious URLs. Outbound scanning helps identify compromised email accounts and account abuses to protect the business´s IP reputation. Our gateway spam filter takes just minutes to install and is easy to manage via a centralized administration portal. Take advantage of a free trial of SpamTitan to evaluate our anti spam gateway solution in your own environment.